As with the Jeeves and Wooster series, do not get this thinking you are going to see anything of Dr. Gregory House. In other things Hugh Laurie is completely different. "Fans of British comedy will have a great time with the two-man ensemble of Steven Fry and Hugh Laurie, who root up laughs in the unlikeliest of places during the two classic episodes on this video. It's inspired nonsense that isn't quite as round the bend as the legendary Monty Python but definitely charges down the same mad track. In dozens of short sketches and a few even shorter comedic bits, viewers meet an overeducated and over-chatty barber, a criminal suspect named for a falling object (which makes his name a bit difficult to spell), Elton John singing "America" over and over, a few aimlessly ambitious businessmen, an outraged father long overdue for a chat about the birds and the bees, and the strange staff of a subtly surreal jewelry shop. While not terribly risquéé and only marginally politically aware, it's definitely funny, with a charming air of improvisation about the whole thing. 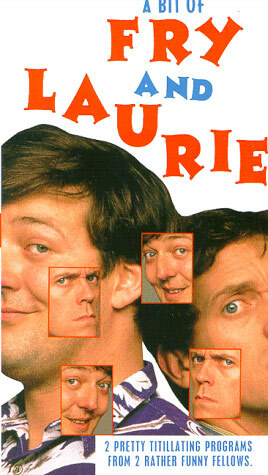 Some scenarios have the funnymen stepping out of character to challenge each other to find a sensible conclusion; other sketches threaten to burst as Fry and Laurie each struggle to suppress their own laughter while trying to send the other over the edge. But it's all done with razor-sharp timing and a keen sense of what makes people laugh. Enjoy this, folks--they're pros. --Grant Balfour"
Description from Amazon "This monumentally amusing video from the stars of Jeeves and Wooster contains over 40 classic comedy sketches written by as well as starring Stephen Fry and Hugh Laurie." For more information or to order, click on the image to the right.